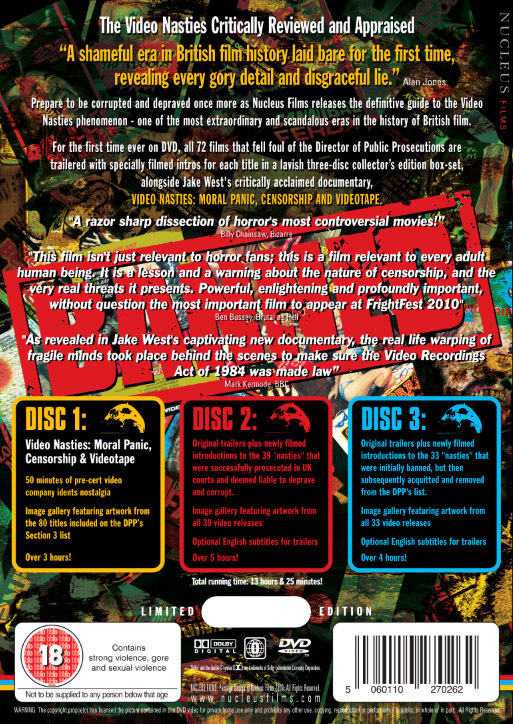 Each and every one of the banned DPP 72 Video Nasties critiqued and explored, followed by the original trailers, for the first time ever on DVD! Discs 2 and 3 can be viewed either as a non-stop trailer show, or with newly-filmed introductions from a wide range of acclaimed media academics and notable genre journalists. Each disc is preceded by a brief introduction by cult horror presenter Emily Booth. Cast: Julian Petley, Marc Morris, Andy Nyman, Xavier Mendik, Christopher Smith, Neil Marshall, Kim Newman, John Hayward, Geoffrey Robertson, Martin Barker, Patricia MacCormack, Mary Whitehouse, Graham Bright, Stephen Thrower, Allan Bryce, Alan Jones, Peter Kruger, Brad Stevens, Clifford Hill, Craig Lapper, Barrie Gold, Margaret Thatcher, John Beyer, Emily Booth, Derek Malcolm, James Ferman, David Grant, Malcolm Fancey, Beth Johnson.